To obtain the desired 'reactive' response from a salmon it's imperative that you don't try to bore the fish to death by letting it see far too much of your salmon fly as your fly approaches it's holding position. 'Startling' a salmon gives you a far better chance of it responding favourably! If you could place yourself in the fins of a salmon for a day it would be similar experience to you or I watching the red arrows crossing the sky at an air show. If you take the average of 6 anglers covering a typically popular salmon beat's fly pool in a morning, afternoon & daily guest rotation for 6 fishing days of the week then by my calculations a resident salmon will be typically seeing at least 30 salmon flies per week. If this isn't brainwashing a salmon in to accepting the presence of a fly then I don't know what is! So the golden question during periods of the salmon fishing season when there's a big build up of older resident salmon in a pool is what can you do to separate your fly from the normal 'boring' fly swing swim of the stereotype fly fisher who's programmed to only go through the motions of casting and who's thoughts stop above the waterline. In this situation there's a few elements to focus in on and that starts with an observant eye that's constantly scanning to see what fly patterns others are failing to hook salmon with! The other things to study once you've ID'd the patterns of fly that the salmon have already seen and not reacted to (and selected something different) are size, depth, speed & spacings. I've always done well with a smaller fly as I'm in no doubt as to the acute eyesight salmon possess. I'm also a great believer in getting right onto a salmon's nose with the fly or certainly into it that square metre of water directly in front of the fish. During late Spring or through the Summer months when most anglers are trained to fish with floating lines with little lightweight polyleaders I'd typically always be using a 15ft type 3 (braided core) proper sink tip to achieve the above. 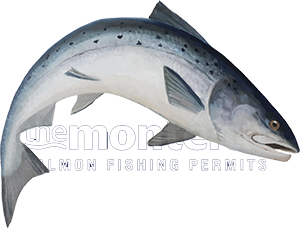 The fly spacing in any salmon fishing scenario is critical and I mentioned 'startling' a salmon early in this article as the last thing you want to do is give a fish too much of a look at your fly until you're right in front of it's nose. To do that you must be separating each swing of your salmon fly by at least 3 feet but often I'm a foot or two more than that between fly swings. If you study the form of many fly fishers you'll see that 2 feet is about the average fly swing spacing. The bigger fly swing spacings provide the better chance of a predatory reaction simply because you've triggered that impulse by 'startling' the fish in addition to the added value of covering miles more water each fishing day! If you get your fly 'fishing' mind into gear and bin the fly 'casting' thought process that's completely taken over in the last few decades and start focussing in on what I've mentioned above then there's only one last element to transform you into a true salmon fly fishing assassin. That last component after the pattern, size, depth & spacing pattern has been given serious consideration is the 'movement' of your salmon fly. This part requires a bit of consistent work but you will be amazed how resident salmon will wake up and react if you stick with it during the fishing day. The moment you've made your forward delivery and thrown your mend (or not as the case may be) start introducing little completely inconsistent tweaks and nudges to your salmon fly's swim pattern. Throw in some 'erratic' quick draws during the swing and get that fly moving through the pool in a completely abnormal & unpredictable manner. If you work on that with due care and attention to the basic elements previously mentioned you'll 'wake up' resident salmon and force the desired reaction! What you're now doing is showing resident salmon something they are highly unlikely to have seen before and their curious nature will do the rest!